Today is Friday and I've decided to participate in Friends With Flair with my pals over at Unity Stamp Co. I made this card a while ago for a call but it wasn't picked up. The stamp is from Christmas Bough (the sentiment.) 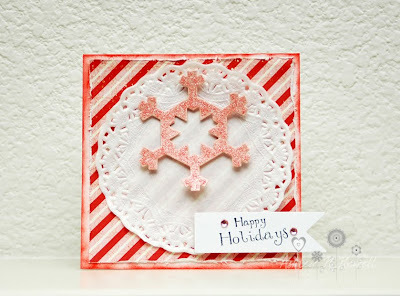 The snowflake and flag are Spellbinders dies and the paper is from Echo Park. Have a great day everyone! Be sure to go to the FWF post on the Unity Blog to see everyone participating in today's hop! Leave comments all along the way because there's candy hidden! Have a great weekend! This is so cute. Love the colors and that snowflake. Sure have miss you my friend. Cute! It reminds me of a big fat candy cane! Love it! Very cute! I love the candy cane stripes. Super cute, Ashley! Love the paper! I totally want a candy cane, now...lol! So pretty!